Most of us learn to brush our teeth when we’re kids — and that means that by the time you’re an adult, you’ll probably need a little brush up on the proper technique. When you don’t brush your teeth correctly, you’re leaving yourself at a higher risk of developing cavities and gum disease. Your dentist in Flint is here to help you nail the right way to brush. Keep reading for the top 5 steps to make sure you’re cleaning properly, every single time! One of the biggest keys to brushing your teeth correctly is making sure you’re doing it for long enough. Two minutes is the sweet spot for removing all the plaque that’s built up over the hours since you last brushed — ideally 30 seconds on each quadrant, or fourth, of your mouth. The best way to make sure you are brushing for long enough at night and in the morning is to watch the clock. Rob the egg timer from the family game of Guesstures, or set the stopwatch on your phone for two minutes. Even better, invest in an electric toothbrush! These come with a built-in timer to help you get a full clean, every single time. Most people do not replace their toothbrush frequently enough. You should be buying a new one every three to four months, or as soon as the bristles begin to show signs of wear. You may also want to get a new brush after you’ve been sick to prevent the spread of bacteria. While you’re picking out your next toothbrush, make sure you choose one that has soft bristles. Using a “hard” or even “medium” brush poses a risk to your delicate gum tissue, especially if you’re a little heavy handed with your cleaning. Don’t brush too hard when you clean! Doing so will injure your gums or cause them to bleed. 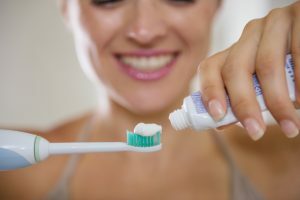 It may feel like you’re doing a really great job when you brush in hard, back and forth strokes, but you could be causing your gums to recede and leaving yourself at a higher risk of gum disease, decay, and other oral health hazards. After you’ve brushed each quadrant of your mouth for 30 seconds each, don’t forget to give your tongue a little attention, too. Cleaning gently here will remove even more of the bacteria that causes bad breath, gum disease, and tooth decay. Choosing a toothpaste that contains fluoride will keep your tooth enamel strong and protected against the acids that threaten to weaken it and cause cavities. Look out for a toothpaste that is approved by the American Dental Association — fluoride is a prerequisite for their approval. Dr. Chitra Naik has been providing high quality dental care for families in and around Flint since 1995. To learn more about the services offered by the “dentist near me” you’re looking for, we invite you to contact the office at (810) 235-5422! by: Dr. Chirta Naik at May 31, 2018 .